Most managers and workers think conflicts is detrimental to the working environment and can harm employees in several ways. Even though the idea is true up to a certain extent, it can be understood as beneficial as well. Most of us have seen conflicts lead to something hazardous like losing jobs, animosity, more discontent and disagreement etc. This is also one of the biggest reasons why some CEOs and bosses prefer to avoid workplace conflicts. However, overcompensation is something that can become extremely dangerous. This happens when everyone belonging to a particular department at work has the same opinion on almost everything. If we take Blackberry as an example, it will be easier to understand about benefits of conflicts in an organisation. At one point, Blackberry was one of the biggest and fastest selling companies all over the world. Today it has been diminished to almost nothing. What the Blackberry executives did is that they didn’t want to understand that consumers prefer smart phones compared to business applications. They did whatever suited their interests best. If a bit of dissention occurred, a difference could have been felt. Nonetheless, in this post, we are going to tell you why conflicts are sometimes good for the working environment. Keep reading to learn. What conflicts do is that they encourage debate and competition which is good for almost any environment. Also, it improves team culture and allows people to learn more. Here employees learn how to handle situations in a professional manner without having to hurl any insults. If you feel there is a particular idea that won’t work, don’t let it just pass by. Raise the topic and let people talk about it. There are a couple of ideas that need some time in order to mature. Speaking of competition, friendly rivalry can boost motivation and push productivity. With more workplace conflicts, you can expect your team to accomplish its goals in no time. This does sound surprising to most of us but is very true. When team members are putting up with disagreements and arguments at your work place, they are automatically able to work towards the goals that should be reached. This happens mostly in the case of project based goals. What happens in this case is the team learns to deal with difficult situations and work in such a way that all challenges can be sorted. Another benefit of conflicts is that it boosts a sense of commitment among team members and employees. However, you should make sure that everyone has the chance of express themselves and say what’s on their mind. It doesn’t matter if their opinions aren’t always positive. It is important for your team members to be aware of what is going on. Conflicts are a vital part of work culture and they nourish your minds in several ways. Conflicts are another interesting way to clarify all doubts. In an environment where ideas and opinions are not the same, the possibilities of conflicts are doubled. And it cannot be stopped. In fact, disagreements will occur no matter what. So it is best to allow a conflict to occur. 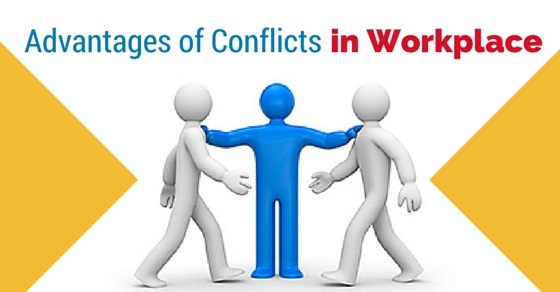 This conflict situation will not only clarify all doubts but also improve work environment. Your employees will learn how to respect and understand each other because of this purpose. One of the biggest advantages that come with workplace conflicts is that it takes away all your stress and anxiety. People who are involved in the argument tend to become more relaxed after they have acted cathartic. Therefore it is always advisable to let those emotions flow. Let people talk about their problems and what they feel like when they are around someone they don’t like. This will definitely create a calm environment in the future. Not only that, your employees will be able to work in a much better way after the conflict has been resolved. Just make sure there is no physical violence during workplace conflicts. Workplace conflicts are the best way to increase productivity. Advantages of conflict resolution are like, people belonging to a particular work group will naturally learn how to become more productive. Instead of spending a lot of time recognising the fact that a problem does exist, it is best to take immediate action, dealing with conflict. This will definitely get the co-workers cost more productivity and help people in your team to stay encouraged and motivated. You will definitely see your group improving over time. One of the most surprising benefits that come with workplace conflicts is that it leaves more room for changes to occur. If you make the mistake of ignoring a problem like it doesn’t exist, things are never going to change. They will always be the same. This will lead to stunted growth and you will witness very limited chances of improvement in the environment. When workers begin to show their differences, it is always a better idea to work through them. Once this has happened, only then will the stage be set for better changes to occur within the group. Keeping the status quo could be seen as a path of very little resistance but if you can make it a point to struggle through it, then something positive will definitely come out of it. With conflicts, new ideas are always created. You can always come up with new techniques and ideas when there is a disagreement at your work place. This is because a problem always allows something new to happen. So don’t always try resolving conflict in the workplace, the moment it occurs. Let it stay and grow for a while. You will see things change and create on their own dynamically over time. If everybody agreed with everything, would there be anything new to learn about? Of course not! But with the entry of conflicts, there are new reasons to check out different perspectives and learn about new techniques to handle new situations. Some of the best ideas of the world have always come out of ashes and the process of solving conflicts and problems in a creative manner will soon begin to reach a very satisfactory manner. Working through disagreements and problems can often bring the best out of people. And this is exactly what conflicts do! Their respect and understanding for each other is improved significantly during this time. People also get to know each other better. So next time there is a problem, both of them will know how to solve it. When you are discussing a difficult situation with your clients and colleagues, it will somehow bring out a negative reaction from a co worker. This will allow difficult problems to surface so that it can be solved. Not just that, as a boss and a CEO you will learn how to deal with tough times so that the best can come out no matter what. According to a survey conducted in the United States of America, 81% of the people happened to see positive outcomes when workplace conflicts occurred. Nearly half of the people who were surveyed said they had a better understanding towards their co workers and employees. Better working relationships and improved skills are also some of the biggest advantages that come with conflicts here. It leads to better performance and innovation as well. Conflicts are quite a natural part of every environment. They usually are of two types. The first one is when there is a clash of personalities and the second one occurs when ideas and decisions do not match. They are not good for any kind of work place but one cannot deny that it is impossible to stop one. Even though it is a wise decision to control such disagreements from occurring and handling conflict at work, but it is also important to let them occur sometimes. You have no idea how much you are going to learn from this. In fact, this will be a great opportunity for you to learn about human behaviour and how people react to different situations. Hopefully this post has helped you understand conflicts better. So the next time you see one occurring at your office don’t stop it right away. Let it grow into something. The results will amaze you. On that note, here’s wishing you good luck and hoping you can deal with situations better in the future. Previous articleWhat to Consider When Negotiating a Job Offer?